Facebook‘s video on-demand service, “Watch,” could easily bring in $US12 billion in sales by 2022, Brent Thill, an analyst at Jefferies, wrote in a note. The social media company’s data-driven approach to video content by employing user-engagement data to tailor videos to its audience will help drive revenues. Shorter and lighter video content will help Facebook differentiate itself from video-streaming peers. To view Facebook’s real-time stock price, click here. Facebook‘s “Watch” tab could be the social media giant’s best bet yet as the video on-demand service could deliver up to $US12 billion in revenue over the next five years, Brent Thill, an equities analyst at Jefferies said. Thill believes Facebook’s push toward “Watch” content won’t significantly impact Facebook’s operating margin, because it’s investing in lighter content that should draw in more revenue per user. The “Watch” tab was introduced in mid-2017 as a way to provide “snackable” video content to users from professionals and personalities, such as Marshawn Lynch and Mike Rowe. The short-form videos “should help drive time spent, more repeat visits, and eventually higher ARPU (average revenue per user),” Thill wrote in a note. Facebook’s data-driven “video first” approach has by and large paid off as the company uses its consumer engagement data from video watchers and users to curate and create videos specifically geared toward them. With many video streaming players out there, Facebook is able to differentiate from the pack because it goes for lighter, “snackable” content as opposed to the premium long-form content that other companies are pursuing. Other digital and media players have spent billions of dollars on content spending, but Facebook’s data-driven approach, as well as its data sharing, will help it rein in its margins, Thill said. “Facebook’s spend will ramp in areas that sees engagement amongst the community, as opposed to making big bets on long-form content,” he said. 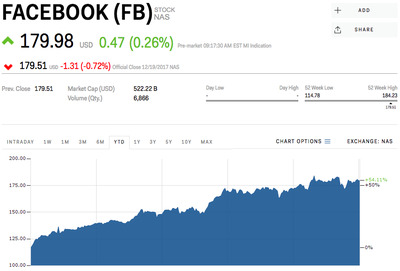 Facebook‘s stock is trading at $US179.98 per share, up 54.11% over the year. To read more about the one thing that could steal the FANG stocks’ thunder, click here.